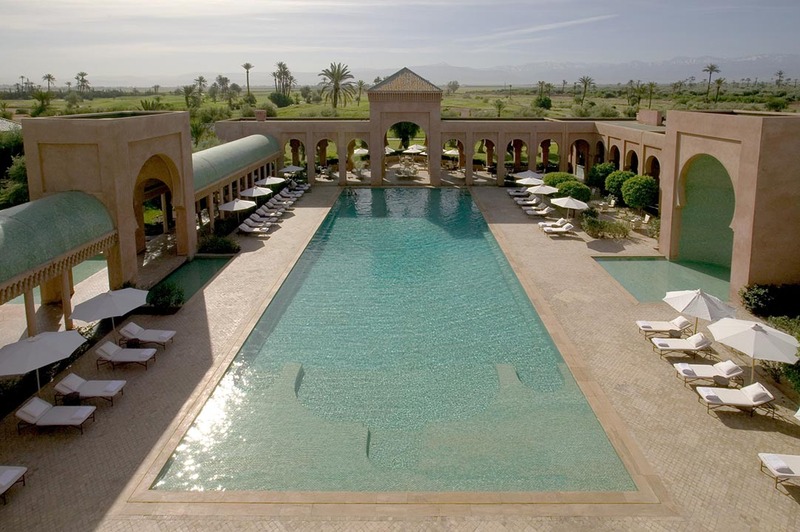 Time and the Universe: Three days recently at the romantic Amanjena resort hotel, a few miles outside Marrakech, was a journey out of time. 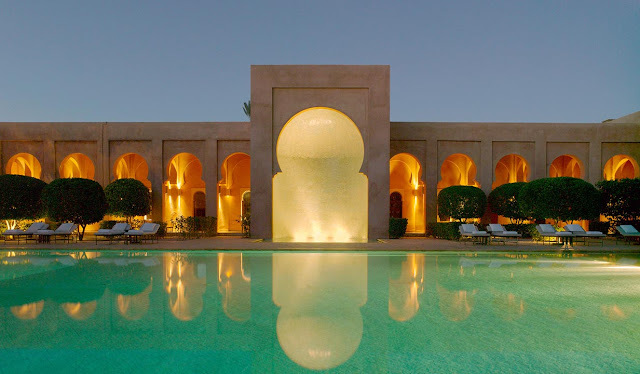 During my visit, I discovered hallucinatory Gnaoua music, enjoyed the early morning silence in the gardens, walked beneath the brilliant night sky, spent hours in a steamy hammam, and in the evenings marveled at Andalusian lute music. Tranquil and mysterious, my visit was pure escape. Amanjena’s terra-cotta colored walls echo those of Al Medina al Hamra (the red city), as well as the Berber villages of the High Atlas Mountains. 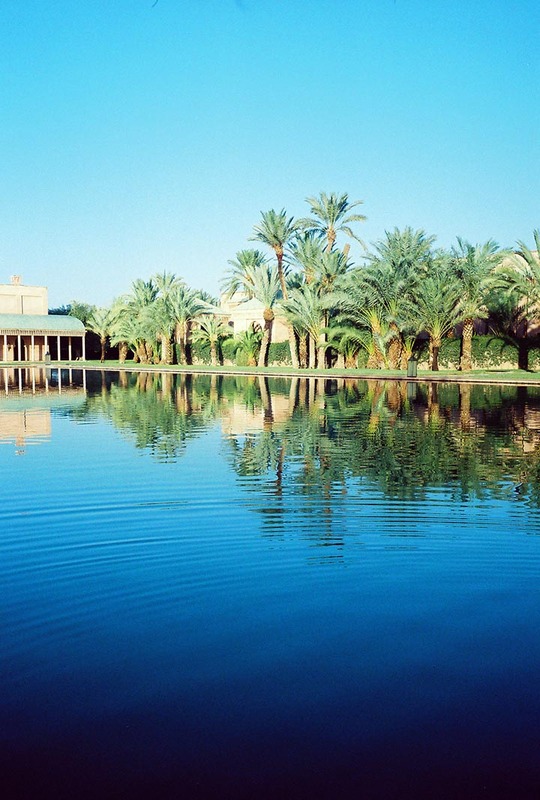 Private, ultra-luxurious, and poised beside a tranquil lake near the city of Marrakech, Amanjena was one of my favorite discoveries in Morocco. Under the direction of the resident manager, Joana Guimaraes, the hotel custom-shapes a visit to the taste and style of the guest. It offers the kind of warm, intuitive and low-key approach I appreciate. In the early evening after I’d spend a day whirling through hidden souks in the Medina to find pale turquoise hand-made slippers, and lovely necklaces of ancient trade beads, I wanted to rest and read and write notes. My butler brought sweet mint tea, then lit the fire in my suite living room. It was a pyromaniac’s dream. Flames leapt and danced. I put down my book and watched the fire, sparks flying. Later, he brought some savory bites along with the menu of the resort’s menu for me to peruse, in advance of dinner. Perfect. Water is a unifying element at Amanjena. 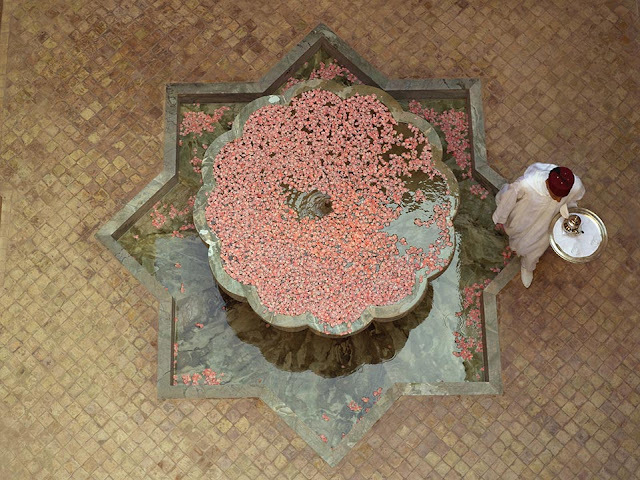 Moroccan marble fountains are strewn with rose petals in the resort’s entrance colonnade. Flowing water is considered a gift in this desert country, a symbol of grace and abundance. Marrakech, formerly desert, was brought to radiant life by the brilliance of 11th century Almoravid irrigation. 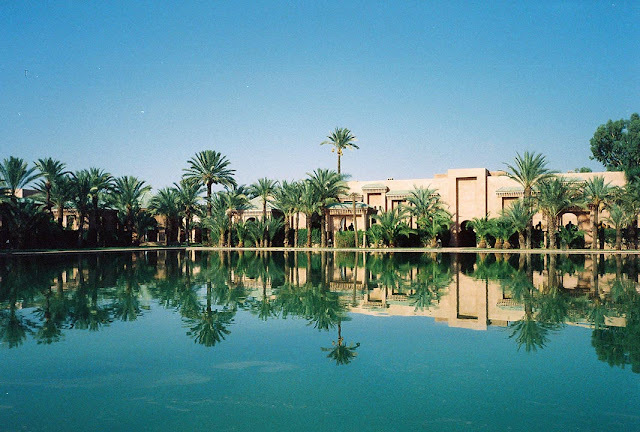 Central to the resort is an ancient bassin, an irrigation pool, inspired by Marrakech’s twelfth century Menara Gardens. Opened in February 2000, Amanjena is the first Aman resort on the African continent. 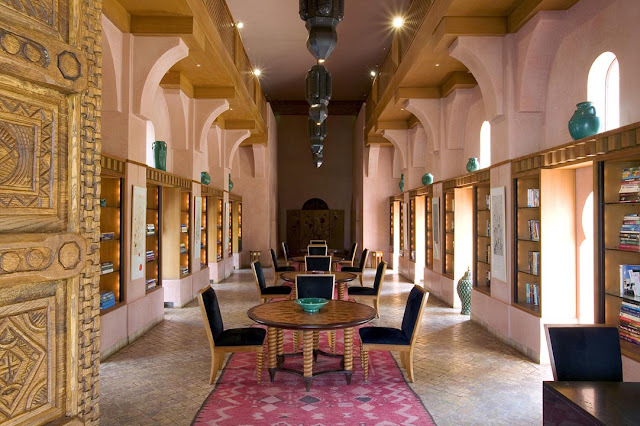 It’s located on the southern road to Ouarzazate. This is the gateway to the Sahara Desert and the High Atlas Mountains command the horizon. In winter, they’re dusted with snow. Amanjena is twenty minutes from the international airport but feels far removed from care and timetables. The drive to Amanjena passes the king’s palace (well, one of them) and Agdal Gardens, a twelfth century expanse of royal gardens filled by irrigated olive orchards and bitter-orange trees. 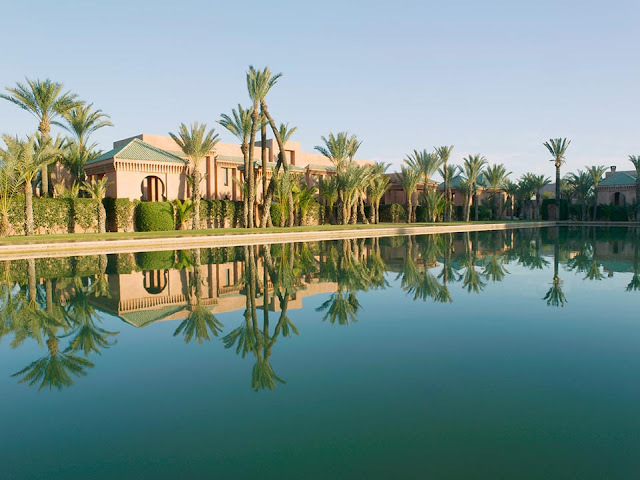 The resort’s thirty-two hidden pavilions and six two-storey maisons radiate out from the bassin. 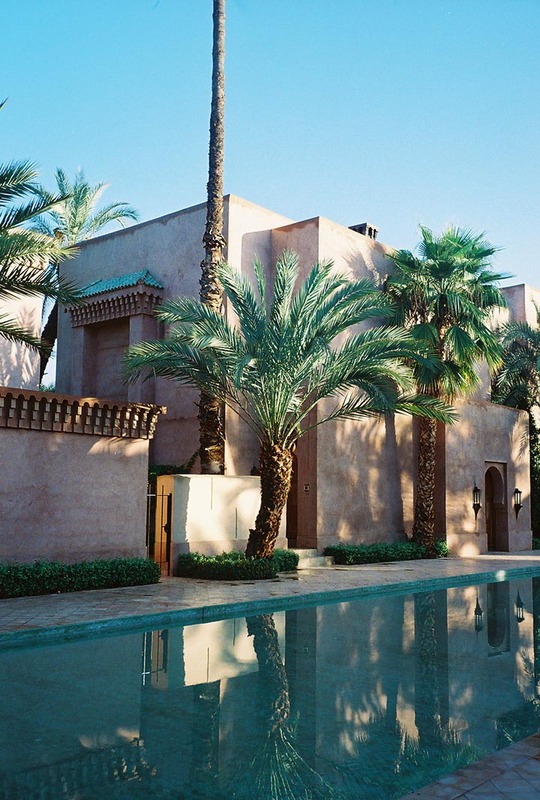 Each pavilion, its high Kasbah-style walls concealing the garden and interiors, opens to a grand, multi-faceted dome. The graduated ceiling is finished in glossy, rich, Venetian plaster, which glows in harmony with the room’s pale peach walls. Moroccan decorative arts are featured in a very under-stated style. 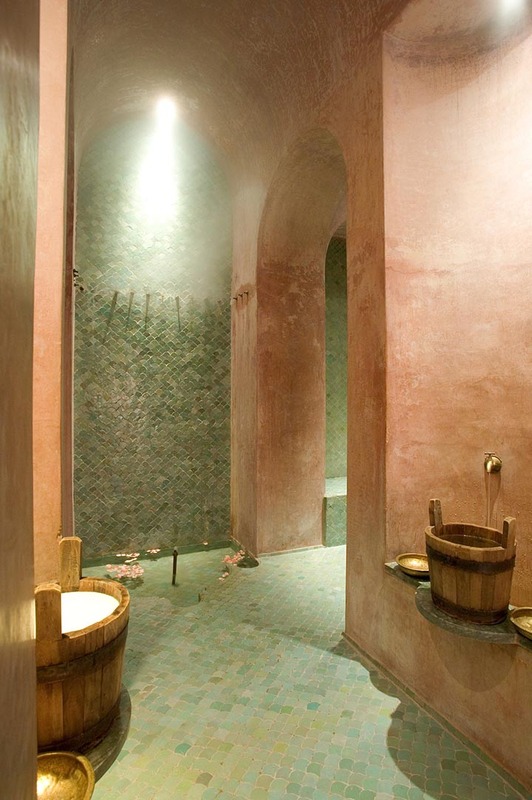 Their lustrous finish is of tadlekt, a plaster treatment originally applied to waterproof hammam (steam bath) walls. 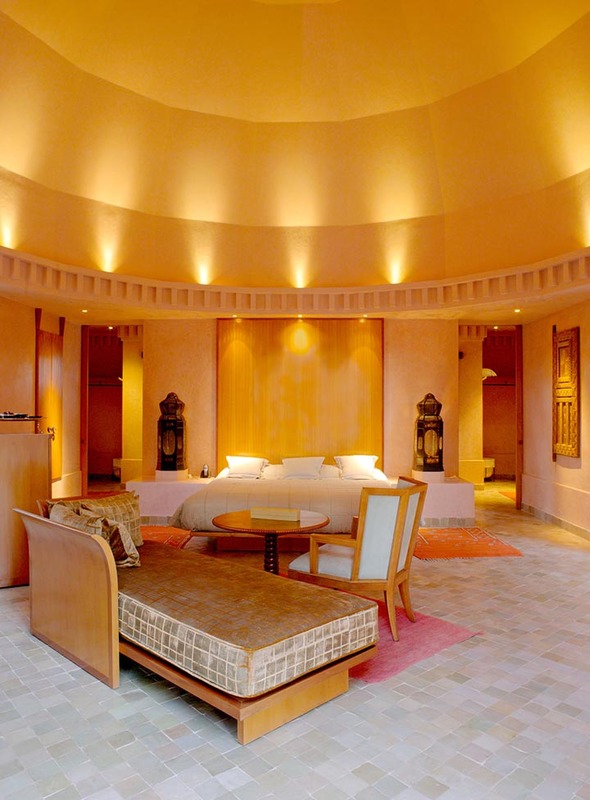 Under the dome, the pavilion bedroom is centred by a king-size bed balanced by Berber carpets and brass lanterns. The desk is finished in Moroccan leather coupled with a cherry-wood chair. A cedar cabinet holds the TV. 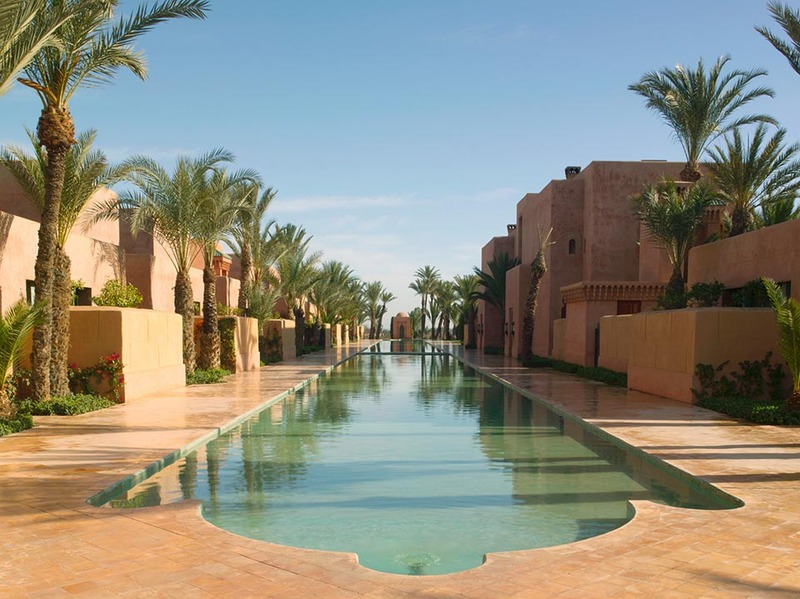 Channels flow to two long canals which feed the resort gardens of olive and citrus trees, soaring date palms, orange-flame bougainvillea, pale peach hibiscus, orange- and white-blossomed rose bushes and pomegranate. Amanjena’s entrance colonnade, with its long, arched entrance gallery, features grand double oak doors-within-doors. Traditional in style, they were handcrafted in Agadir. 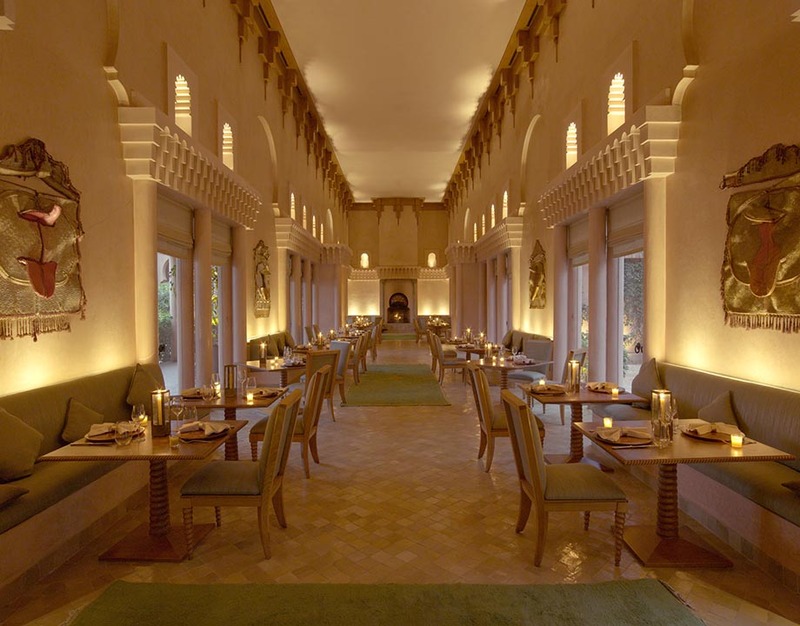 A cedar ceiling soars nine meters high, supported by the colonnade’s straw-flecked columns. To the left of the lobby are the salons of the Bar/Fumoir. Further along is the two-storey Library, with its Arabic carpets, ceiling lanterns and upstairs gallery for fireside reading or daydreaming. To the right of the lobby is the Moroccan restaurant, open for dinner. 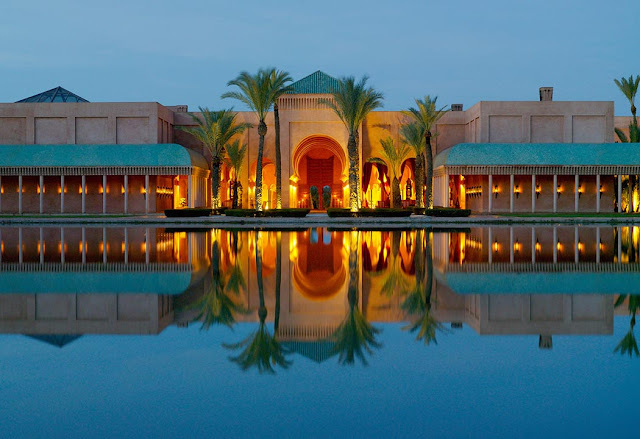 Specializing in innovative approaches to the local cuisine, as well as Continental dishes, The Moroccan has more than eighty onyx columns, plâtre ciselé artwork, moucharabieh-wood screens and a commanding pyramid skylight. 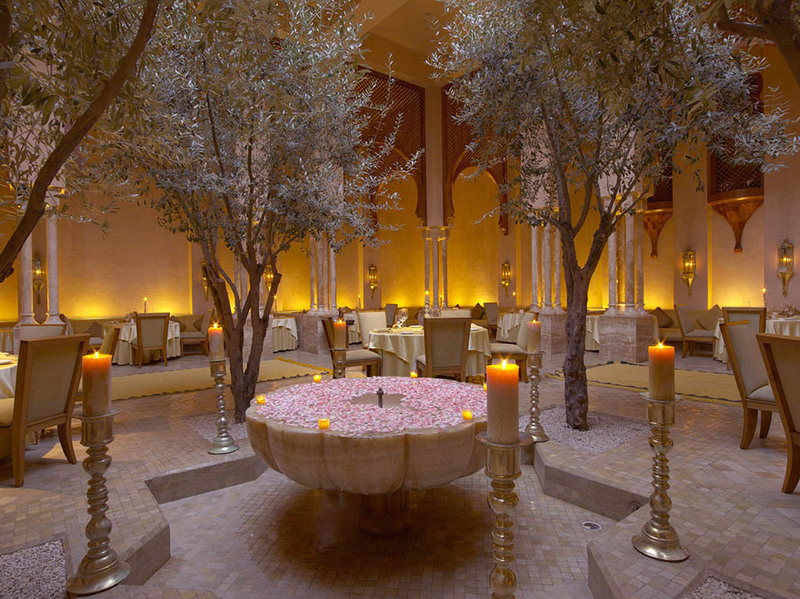 The Restaurant, alongside the swimming pool, is open for breakfast, lunch and dinner indoors and in a garden courtyard. Authentic Thai cuisine is featured for lunch and dinner. The columned Pool Terrace and the outdoor swimming pool are finished in glittering-green tiles of écaille de poisson-cut zellij (like fish scales) and adjacent to the resort’s three boutiques. Prepare to enter a dream state. Prepare to drift off and dream. This hammam/spa has private hammams, with hand-made tiles in shades of pale clay and celadon. The steamy ritual, which Moroccan women enjoy once or twice a week, is a series of delirious soaping, scrubbing, splashing, sluicing, washing, rinsing, rose-scented mud, eucalyptus-scented black soap, and dizzying massages with an abrasive scrub mitt. 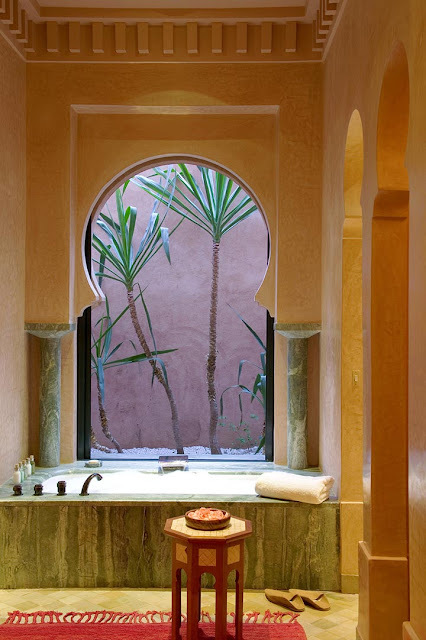 The masseuse, a young Moroccan woman attired in a flesh-colored leotard and tights, smoothes and sluices, splashes and throws buckets of water to rinse and repeat. Hours pass. It’s silent, enclosed, and mysterious. No effort is required. No thinking is demanded. Everything falls away. Eventually, after who knows how long, it is time for a quiet mint tea—and, surprise, a massage and pedicure. I hear birds twittering in the garden. Is it evening already? I would hardly know. I walked back to my pavilion through the candlelit garden, the lights flickering across the basin. No sound broke my reverie. Mind and spirit refreshed, inspired. Design of the resort was by Ed Tuttle, a California-born, Paris-based architect who has been responsible for so many of the Aman resoerts. Cedar doors lead to the pavilion’s garden courtyard and views to the adjacent golf course and olive groves. Eight pavilions have a heated pool and an extended private garden. A large lounging couch, flanked by black lanterns, rules the courtyard. The dazzle of hand-cut glazed tiles known as zellij features in a fountain recessed into the terracotta-tiled floor. 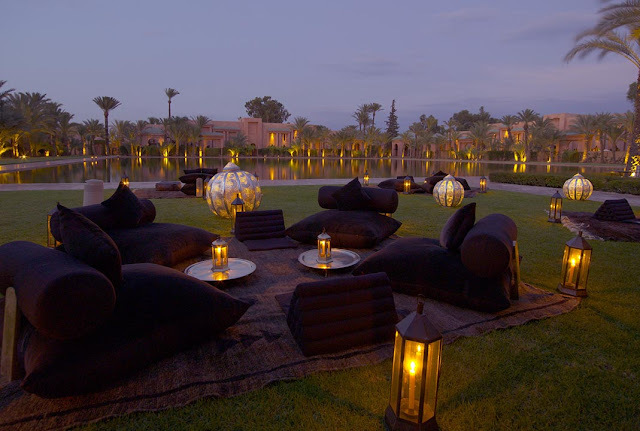 Chaises longues and candle lanterns lend a mood of Moroccan indulgence. Amanjena’s pavilions rise seven meters from floor to ceiling in a variation of the Moroccan town house. Trines of second-floor windows look inward, as if to a garden courtyard. I asked the assistant general manager of Amanjena Omar Bouzarte, for his suggestions. 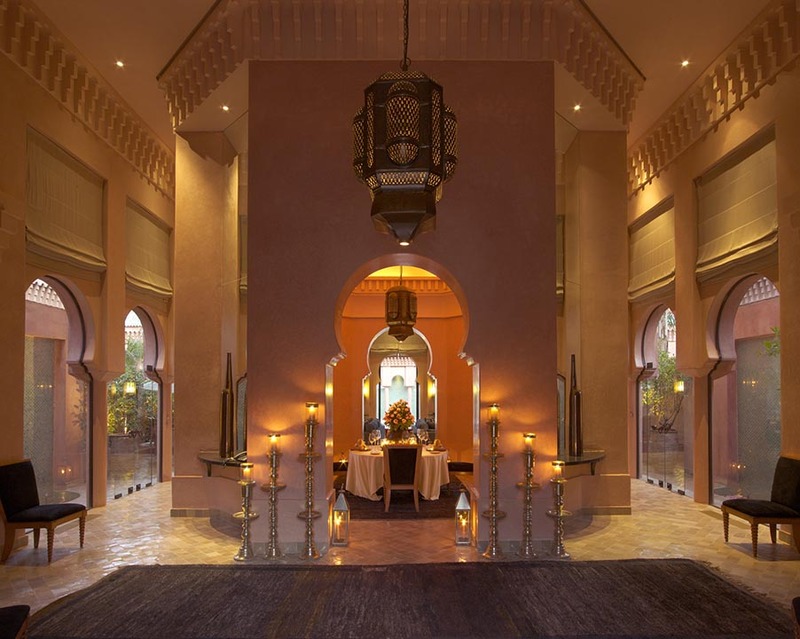 A half day guided tour (the hotel has excellent guides to recommend) offers time to explore the rich history of Marrakech through the Medersa and the Marrakech museum, as well as the new photography museum. Guides will craft their walking routes to guests who want to wander through the Medina and to discover the souk. Marrakech’s most dramatic landmark is the twelfth-century Koutoubia Mosque and its towering minaret, the tallest structure in the city. Established in the 14th century, the Ben Youssef Medersa is among the most beautiful of Marrakech’s buildings. Recently restored, the former Islamic theological college, with its inner courtyard, makes for a peaceful interlude. Where there are palaces, there are tombs and few more inviting than the Saadian Tombs, one of Marrakech’s most visited sites. Dating from the 16th century, the tombs are set in and about two intricately adorned mausoleums, one of which is the last resting place of Ahmed El Mansour, the greatest of the Almohad-era sultans. The central hall in Mansour’s mausoleum reveals exquisite examples of Moorish-Moroccan decorative art. Marrakech’s medina or ancient quarter is an inner world of winding lanes, souks and streams of Marrakchi merchants and shoppers wrapped in cotton or wool djellaba. There, in stall after stall are textiles, carpets, leather work (including babouches, the Moroccan leather slippers) and in souk after souk, jewellery, pottery, woodwork, copperware, furniture, silverware, fashions, and crafts. A guide can take a guest, on request, to Au Fil d’Or in Souk Semmarine. Upstairs are displayed babouches for men and women, including luscious mauve suede, gray flannel, purple silk. These are a favorites of Andre Leon Talley and his Vogue pals. Bill Blass, Nan Kempner, and rosters of chic and well-dressed have been clients. Downstairs, racks of braid-embroidered jackets, ivory silk djellabas and refined caftans. Ask the genial owners to recommend jewelers and craftsmen in this quarter. It’s very un-touristy, quiet, elegant. 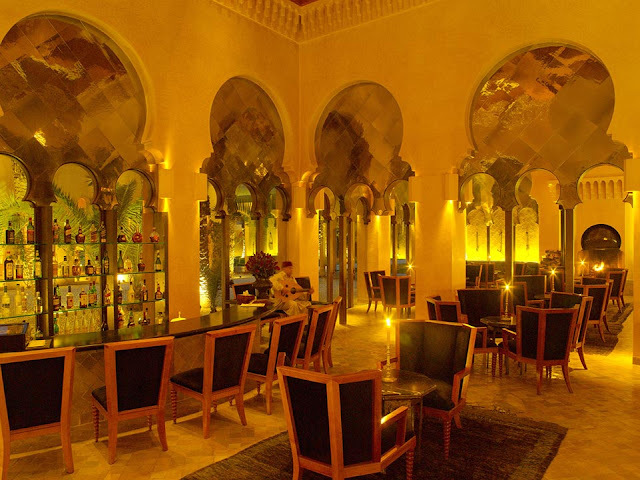 Enjoy lunch at Grand Café de la Poste, a recommendation of Joana Guimaraes, resident manager of Amanjena. With its palm trees, patterned tiled floors, ceiling fans, and (occasionally) pianist, it will remind you of ‘Casablanca’. Suggested: a dozen Oualidia oysters (from the coast south of Essaouira) washed down with a glass of chilled white. Salade Nicoise. Roast sea bass. Lunch might also include a local goat's-cheese salad, croque monsieur, or grilled sardines. A lively scene, mostly chic locals. Beyond Marrakech, escape into the High Atlas Mountains for a morning or afternoon visiting remote Berber villages and their markets. Or hike into the hills, rife with trails. For climbers, Mount Toubkal is Morocco’s highest, the third-tallest peak in Africa. In the short winter season, there is skiing in the mountain village of Oukaïmeden, just 70 kilometres south of Marrakech. Depart from Amanjena and drive about 45 minutes towards the Lake Lalla Takerkoust. After kitting out with safety equipment and an introduction to the vehicles, the tour in the desert landscape of Agafay begins. After about an hour of riding explorers reach La Pause, a rustic camp and sit down for lunch. A typical Berber lunch is served, with vegetables coming from their own garden. A scenic drive through the fertile valleys at the foothills of the Atlas Mountains. A gentle walk through traditional Berber villages with verdant terraced fields. After walking the paths outside mud-walled houses, explorers enjoy the hospitality of a traditional village resident and an authentic lunch made from organic products from the region. Guests may be surprised to be offered a full tour of the house and discover traditional interiors, including earthen bread ovens. The hotel will arrange a helicopter to take guests to the remote Sahara desert. It is a harsh but beautiful environment, worth visiting for the scenery alone. The combination of impressive fortified kasbahs and dromedary-rides make this a memorable trip. High Atlas Mountains: The foothills are no more than 45 minutes drive from Amanjena, past fields of corn and barley and orchards and olive trees. With their dramatic switchback roads, the mountains reveal many dazzling pieces of the past, from ancient mosques to crumbling kasbahs and Berber villages that seem as one with the cliff sides they cling to. A rampart-circled port, Essaouira is an historic city of white-painted buildings trimmed with electric blue. 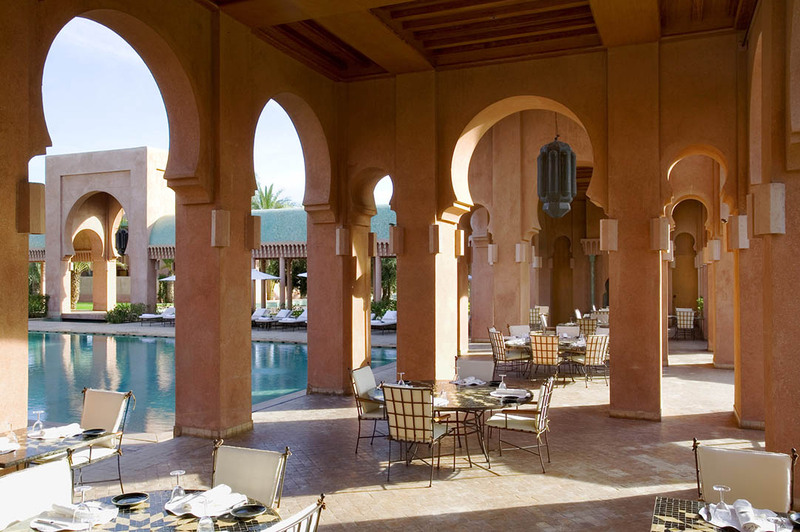 Guests may explore the medina and enjoy a seafood lunch or romantic dinner at L’Heure Bleue Palais private hotel. 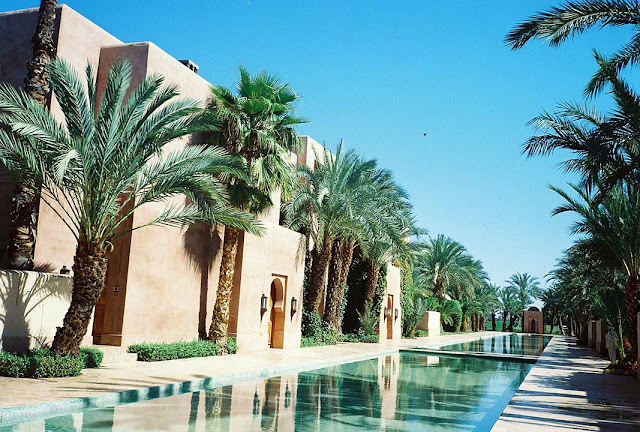 After a day of exploring the region, it’s rather wonderful to laze around the pool and do nothing, far away from the hustle and bustle of Marrakech. Dream in the warm sun. Doze in the shade. Perhaps play tennis on Amanjena’s courts. 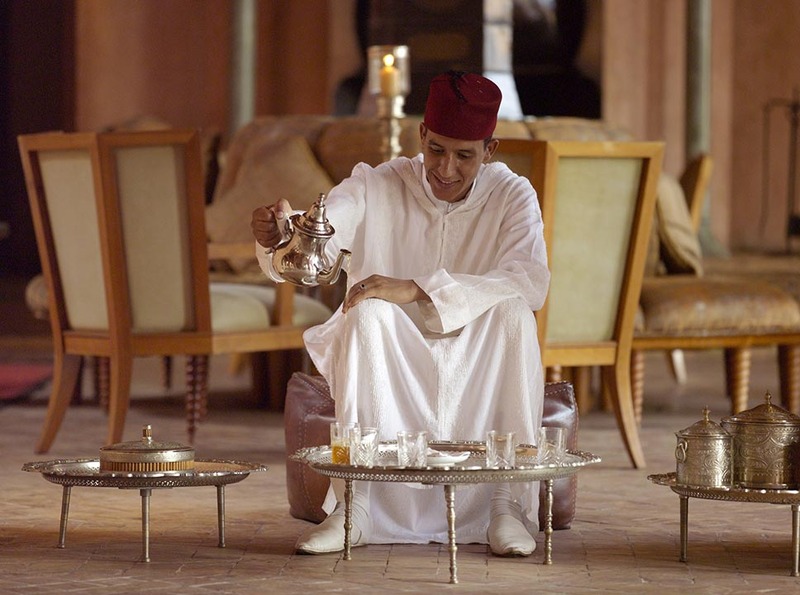 In a decorated traditional tent, totally private, hotel staff creates a magical journey through the flavors, scents and sounds of Morocco. The fantasy scene might include dancers and musicians and traditional singers and lute players and flames flicker in handcrafted iron braziers and cast mysterious shadows across the garden. The Kingdom of Morocco is a constitutional monarchy. Moroccans know their country as Maghrib. In Arabic, the word means ‘sunset’ or ‘west,’ acknowledging the kingdom’s place as the most western of the Arabic countries. Bordered in the north by the Mediterranean and to the west by the Atlantic, Morocco’s coast has excellent beaches and a long and dramatic coastline. 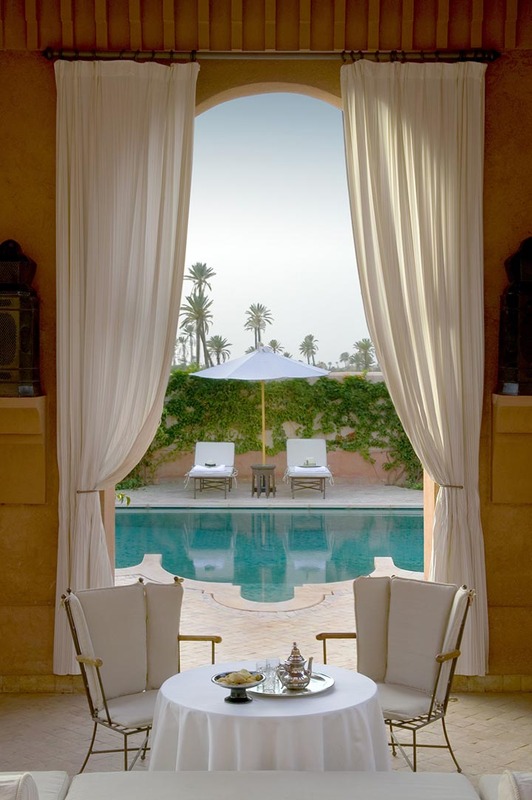 To the east are four mountain ranges and the great oases and dunes of the Sahara. At 4,165m, Mount Toubkal, in the High Atlas Mountains, is the third highest peak in Africa. Climate: subtropical. Morocco’s latitude is similar to that of Southern California. Like California, Morocco’s varied landscape shapes a climate of great diversity, with extremes in the desert and mountain regions. While travelers may not want to experience Morocco’s southern desert in July or August, summer hiking in the Atlas Mountains is a popular activity. Summers in Marrakech are hot and dry, with temperatures reaching 38°C (100°F). Sun is the rule year-round, with occasional rain falling from October through March. 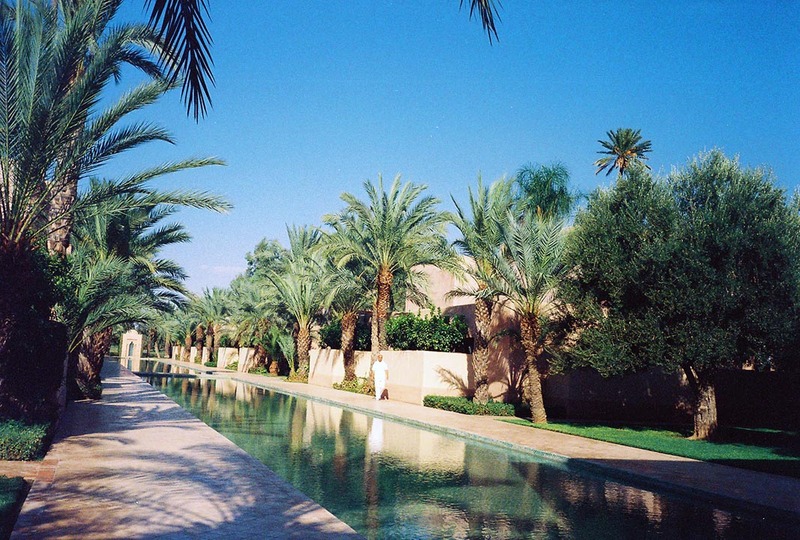 Marrakech’s long temperate winters, November to April, settle in with pleasant average temperatures of 22°C (71°F). Most days are warm enough to sunbathe around the pool. Interior images of Amanjena courtesy Aman Resorts, used with express permission. Images of the lush palm gardens, the pools, and architecture by Diane Dorrans Saeks. Copyright, Diane Dorrans Saeks. Could anything be more gracious? I love Morocco, but I think I'd love it more in such exquisite luxury! Marrakesch... I have great memories of arriving there by car just before sunset and from the distance seeing the orange-pink city with the backdrop of the Atlas. Your enchanting description makes me want to go back soon. Happy New Year Diane, may it be full of beauty and serenity. Morocco and Marrakech have everything you love--textiles and vibrant life, gracious people, wonderful music, and life going on vividly. History, culture. 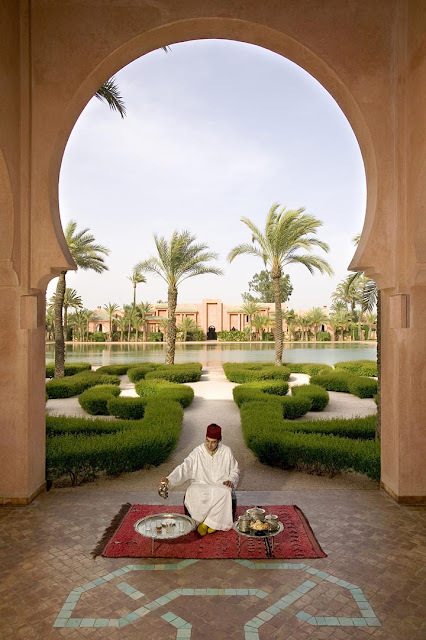 My partner, David and I are planning a trip to Morocco next March and plan on visiting Fez and Marrakech. Your posts are a wonderful source of inspiration and information for our trip. Any additional recommendations would be wonderful and deeply appreciated. I think we definitely want to hire a guide.